As I wrote in one of my previous posts (see here) SSDT leaves test data in tables after it executes INSERT command. One of the methods to delete these data is to use a special script in post-test action. The second method is to use transaction to run the unit test. Obviously we can use explicit BEGIN TRANSACTION and ROLLBACK commands to execute test script. But it needs some effort to change the testing script. SSDT offers another graceful solution as described in MSDN. 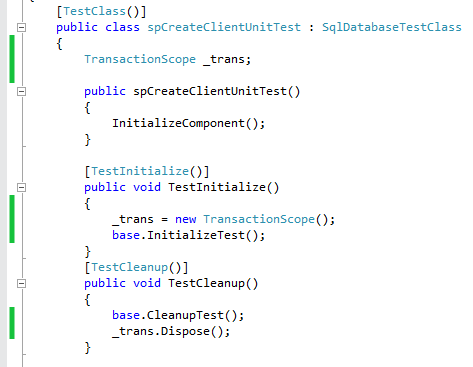 We can declare the transaction in C# code (that’s .cs file for unit test). Right-click the unit test in Solution Explorer and select View Code. Declare TransactionScope variable in a test class. Create a transaction in the Init() method. Dispose of the transaction in the Cleanup() method. This is a great post, its saves lots of time to write and to manage the delete statements. The only issue I came up with, is that the transactionScope requires MSDTC, which I don’t want to enable in our environment . Good idea to use ExecutionContext.Transaction. I found a limitation for this method – it works well only if your post-test block is empty. But for our purpose to run the test within transaction, there’s no need to write any command in post-test block (usually we delete testing data here). If you place in the post-block, for example, SELECT command that retrieve data from the table being modified in the test block, your test would fail and you’ll get the exception “Timeout expired”. That’s because we start a transaction, and does not commit or rollback the changes yet. So the SELECT command in post-test block would wait for the lock to be released.